I love the combination of eggs and potatoes; no matter if it is a fried egg with some hash browns or the recipe that I am posting today. One thing about the egg and potato combo, it can be eaten anytime of the day. Yes, I have eaten it for breakfast, lunch, and dinner. When I saw this recipe in August at It All Tastes Greek To Me I pinned it right away, because I knew that it was something that I definitely would be making. It has been on my mind ever since and finally this past weekend I made this potato crusted omelet. Eri from It All Taste Greek To Me pointed out in her post that you can use whatever you have on hand for this omelet. It is one of the things I love about it, because whatever you put into this omelet is going to come out tasty. The potato crust not only is it tasty, it is a great way to present this omelet. I did change it up from what the original post had, since I didn’t have everything at hand. But no matter what, it turned out delicious. I also decided to make my omelets in individual servings for something a little different, but if you don’t like it this way you can make it in a baking pan. My guys at home gave it a two thumbs up and noted that we have to make this recipe again. So check out It All Tastes Greek To Me. Eri always has great recipes and lovely pictures on her blog. So if you are looking for a new way to make an omelet I hope you try this out. 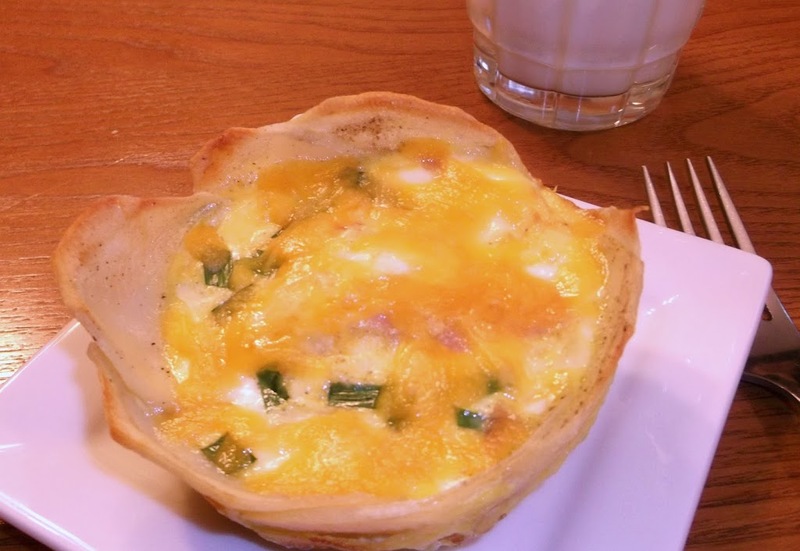 It is simple to make and a great way to make an omelet. Enjoy!! Slice potatoes into thin slices, place them in bowl of water and let them sit for 10 minutes, drain and dry with a paper towel. Spray a baking pan with nonstick cooking spray and lay the potatoes in a single layer on the pan. Sprinkle with salt and pepper to taste. Drizzle a little olive oil over the potatoes and put them into the oven. Bake the potatoes for 10 to 15 minutes or until they are a little soft. Remove the potatoes from the oven and set aside. Add eggs to bowl along with the milk and beat until blended. Add the ham, chives, onion, cheddar cheese, salt and pepper to taste. Spray ramekin (I used custard cups) with a nonstick cooking spray. Start by covering the bottom of the ramekin with the potatoes and then add around the sides of the ramekin with a single layer of potatoes. Once the potatoes are in the ramekins add the egg mixture. Set the ramekins on a baking pan or jelly roll pan and bake for about 35 to 40 minutes. Remove from oven and sprinkle a little more cheese on top, let cool for a few minutes. 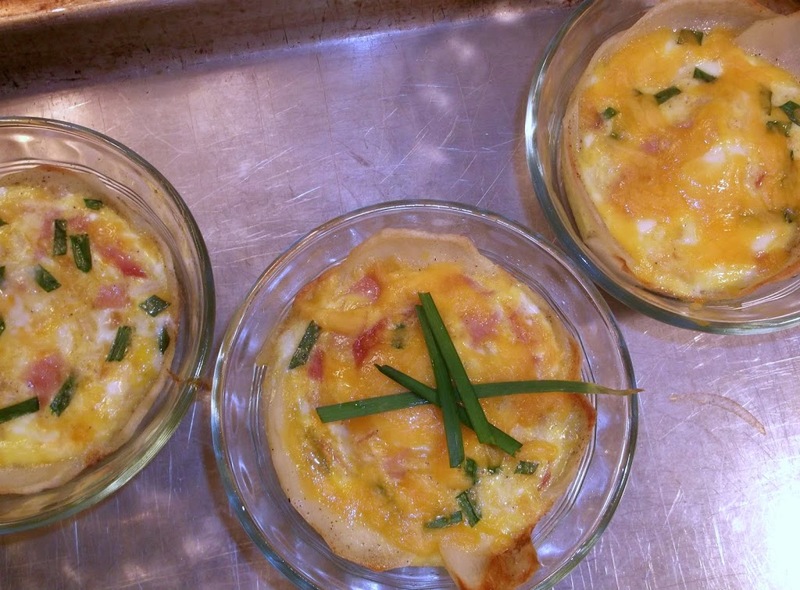 Remove omelets from ramekins and place on plate and serve. Enjoy! 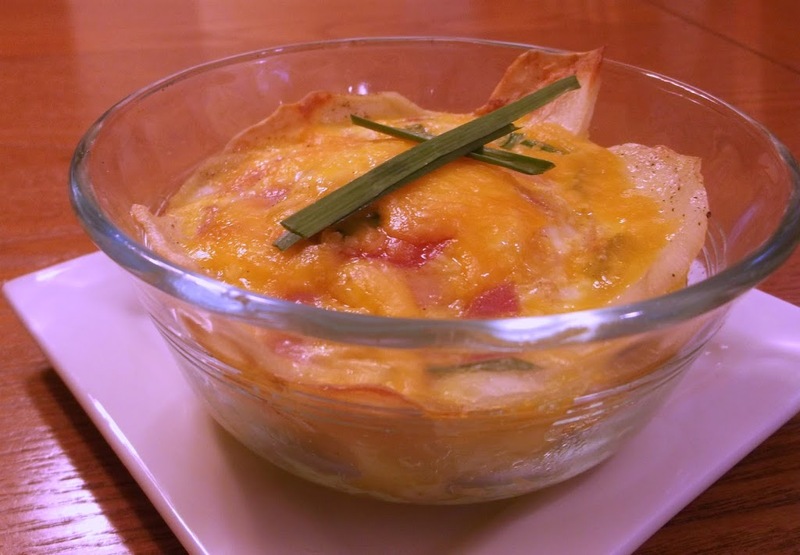 A great idea to combine potatoes and eggs in this way & preparing them in the oven … Looks very tasty! I love potatoes with my eggs too… they look fantastic. I love potatoes and eggs together. What a great recipe!